Leading organic tea manufacturer adds to its popular Mushroom Wellness Teas* collection. 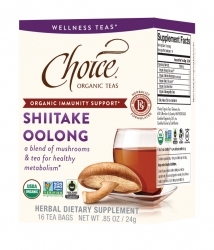 Seattle, WA, October 02, 2018 — Choice Organic Teas, the Original Organic Tea Company in the U.S. and the leading purveyor of exclusively organic teas, introduces Shiitake Oolong Mushroom Wellness Tea* into their Mushroom Wellness Teas* collection launched in 2017. Fair Trade Certified™, Non-GMO Project Verified, and always organic, Shiitake Oolong was formulated to promote a healthy metabolism and support immunity. The tea pairs shiitake mushrooms with synergistic herbs ashwagandha and eleuthero root, plus invigorating oolong and smoked black tea for an aromatic, savory taste. Shiitake encourages normal immunity and stimulates metabolism. * Eleuthero root and ashwagandha support endurance and a balanced stress response. * Oolong and lapsang souchong tea help boost your energy and provide antioxidants. * It’s a rich and smoky cup with seductive hints of umami, sure to motivate and inspire. This addition to the popular Mushroom Wellness Teas* collection, which also includes Reishi Matcha, Shiitake Turmeric, Shiitake Maté, and 2018 NEXTY Awards finalist Reishi Detox*, demonstrates Choice Organic Teas’ continued and consistent growth in the natural channel. “With functional mushrooms topping the natural food and beverage trends for 2018, interest in mushrooms as a functional ingredient is stronger than ever, making this new blend poised to peak the interests and taste buds of tea drinkers and natural health proponents,” said Anne-Marie Phillips, VP of Sales and Marketing at Choice Organic Teas. As with the entire Wellness Teas* collection, Shiitake Oolong was specially formulated with the help of a master herbalist at Bastyr University and artfully crafted for great taste by the sourcing and blending experts at Choice Organic Teas. The teas are classified as Herbal Dietary Supplements (HDS), indicating that the product has met FDA standards for quality and testing. All the teas are certified organic by QAI for USDA Organic certification. Shiitake Oolong is now available to purchase online at www.choiceorganicteas.com The rest of the Wellness Teas* collection, including the entire Mushroom Wellness Teas* line, are offered in retail at the price of $5.49 and are available online and at independent natural retail stores nationwide. A portion of the proceeds from each box is given to Bastyr University’s student scholarship fund. Save the date and celebrate National Mushroom Day with the #MushroomTeaTalk Twitter Party Monday, October 15th at 3pm PDT. Choice Organic Teas will be introducing Shiitake Oolong, talking Mushroom Wellness Teas*, giving away prizes, and more. RSVP at http://mushroomteatalk.rsvpify.com. A brand of Granum, Inc. in Seattle, Washington, Choice Organic Teas made its debut in 1989. As North America’s #1 selling exclusively certified organic tea line, Choice Organic Teas has promoted the growth and development of organic agriculture in tea estates worldwide and offers more than 70 varieties of teas and herbal infusions available in tea bags and loose leaf. In 2000, Choice Organic Teas became the first tea crafter in the U.S. to offer Fair Trade Certified™ tea and in 2010, it became the first tea company to be Non-GMO Project Verified. Choice Organic Teas is one of the few tea companies that packages its own tea, which gives it direct control over quality, food safety, and costs. And, since it is all packaged in the United States, it contributes to U.S. jobs. Visit www.choiceorganicteas.com for more information. Bastyr University, located near Seattle, Washington, is internationally recognized as a pioneer in natural medicine. As the largest accredited university for natural health arts and sciences in the U.S., Bastyr offers more than 20 degree and certificate programs in fields such as naturopathic medicine, acupuncture, midwifery, and whole-food nutrition. Founded in 1978, the University now includes a leading-edge research facility (the Bastyr University Research Institute) and outstanding clinical training at Bastyr Center for Natural Health. The University’s second campus, Bastyr University California, opened in San Diego, California, in fall 2012, becoming the state’s first and only accredited school of naturopathic medicine. Visit www.bastyr.edu to learn more.